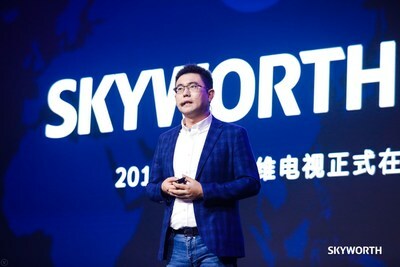 BEIJING, March 30, 2019 /PRNewswire/ -- SKYWORTH, the pioneer in big-screen Artificial Intelligence of Things (AIoT) and a leading global television brand, announced a bold new strategy to drive AIoT to the big-screen and revolutionize smart home technology. 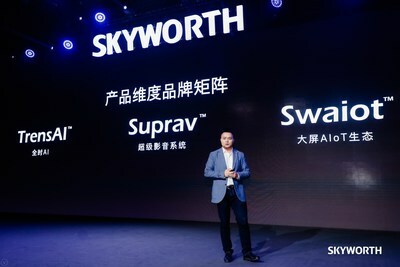 At the "Racing to the Future" Spring Product Launch hosted on 27 March in Beijing, SKYWORTH introduced the first ever AIoT ecosystem featuring SKYWORTH's Swaiot™ system and the Q80 series TVs, the first hubs designed specifically for Swaiot™. At the Spring Product Launch, SKYWORTH also announced its new brand proposition - "Lead the future" and "Pioneering in Big-screen AIoT". The Company has incorporated the brand proposition into its brand graphics. "SKYWORTH - Lead the future" was incorporated into the main logo, while an auxiliary logo with " Pioneering in Big-screen AIoT " was also created to symbolize a new stage of development for SKYWORTH TV, which hopes to lead the transformation of the TV industry along the big-screen AIoT development in the near future. The advent of 5G technology is set to fundamentally reshape the world we live in, and SKYWORTH is at the forefront of some of the most exciting and game-changing technological developments that will redefine everything we know about television. As 5G technology rolls out, the volume of globally transmitted data will grow rapidly and exponentially. Higher bandwidth and stability, combined with lower latency will usher the transformation of the Internet of Things (IoT) to the Internet of Everything. SKYWORTH is driving exciting new breakthroughs in the Artificial Intelligence of Things (AIoT) by combining two transformative technological trends; AI and IoT. The fusion of these cutting-edge technological trends will allow SKYWORTH TVs to better adapt, anticipate and understand users' needs. It will allow SKYWORTH TVs to seamlessly coordinate with other devices, and interact naturally and comfortably with users. 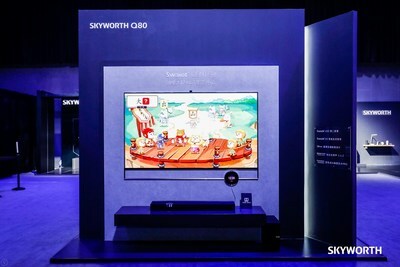 With a growing number of consumers around the world introducing internet-connected devices into their homes, SKYWORTH has identified televisions as the natural hub. As the leader and pioneer of the domestic TV market, SKYWORTH will leverage on its accumulated resources and technological advantage to achieve comprehensive transcendence and lead the future AIoT development during the 5G era. With its world-leading R&D capabilities, SKYWORTH is also perfectly positioned to build the big-screen AIoT ecosystem with Swaiot™, a unique technology model among industry peers. 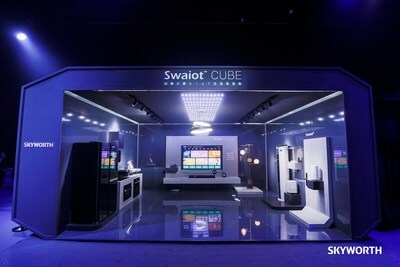 Swaiot™ seamlessly connects with the entire ecosystem of AIoT and IoT devices, enabling users to view, control, and manage all their smart home devices from their television. With the unique TrensAI™ function, televisions can now create the Swaiot™ CENTER for interaction with other smart home devices. Swaiot™ is supported by SKYWORTH's cutting-edge AI technology, TrensAI™. TrensAI™ is the intelligent epicenter that powers a smart assistant which adapts to and anticipates users' needs, allowing for effortless smart home management. The smart assistant can fluidly converse with users by voice with a high degree of accuracy thanks to its powerful AI natural language processing capabilities. It can even do so from a distance with enhanced far-field speech recognition. The technology can readily respond to spoken language and distinguish between voices of different household members, providing personalized responses based on each users' individual characteristics. The revolutionary impact of Swaiot™ reaches far beyond televisions, covering a wide range of home appliances and supporting multi-screen inter-communication between the SwaiotTM CENTER and other SwaiotTM smart appliances (such as refrigerators, range hoods, and more). This progressive and adaptive technology is compatible with smart devices from other brands, such as electrical appliance manufacturer Midea. With the aim to promote big-screen AIoT in the industry, SKYWORTH will work with different partners to enhance the application and future growth of Swaiot™ with an aim to accelerate the development of hardware and software applications. "SKYWORTH is bringing AIoT to homes with its proprietary Swaiot™ technology, redefining everything we know about televisions and transforming them into intelligent AIoT hubs. With Swaiot™ technology, we are leading the development of big-screen AIoT and a TV industry revolution," said Tony Wang, Chairman & President of SKYWORTH TV, during the Spring Product Launch. In the era of AIoT, voice control with display has become the focal point of the Internet of Things. Some mobile manufacturers have realized the interconnection between personal and IoT devices through voice recognition technology. For smart homes in the AIoT era, family sharing requires a centralized display to act as the access hub for Internet of Things. Skyworth CooCaa has been investing in smart big-displays for a decade and has mastered all the core technologies in the field. In time of smart home with AIoT, Skyworth will further empower every display at home to achieve multi-display connection in the household. Each single display acts as an entrance to the AIoT ecosystem with the ability to interconnect with one another, while the one in the living room will be the perfect "core display". The Q80 series TV is SKYWORTH's first Swaiot™ CENTER big-screen AIoT hub. With both the technical capabilities of SwaiotTM and TrensAI™2.0, users can view, control and manage all household SwaiotTM devices on one screen through distant voice interaction. Available in 75" and 82", the Q80 series TV features a full-screen design with seamless wall mounting, as well as top-of-the-line configurations to ensure display and sound quality for users. The Q80 series aims at promoting an immersive entertainment of big-screens, whilst allowing effortless control of smart devices. SKYWORTH Q80 series TV will be available soon, pricing at RMB29999 and RMB39999 for the 75" and 82" model respectively. SKYWORTH Digital Holdings Limited (HKG: 0751) is a leading supplier of uniquely advanced and affordable technology solutions. It is valued in excess of US$ 19 billion and employs over 40,000 people worldwide (as of 1 March 2019). Headquartered in Shenzhen, China's "Silicon Valley", Skyworth offers consumer electronics, display devices, digital set-top boxes, security monitors, network communication, semi-conductors, refrigerators, washing machines, cell phones and LED lighting. Founded in 1988, it is now one of the Top Five Color TV brands in the world and a top brand in Chinese display industry market. It is also a Top Three global provider of the Android TV platform.